Established in 1996, The Military Heritage Plaza, created from the generosity of the Classes of '50, '51, '52 and '53 honors the University's history as a military institution as well as Clemson alumni who have served the United States in times of war. The Plaza was dedicated at 2 p.m. on June 8, 1996. 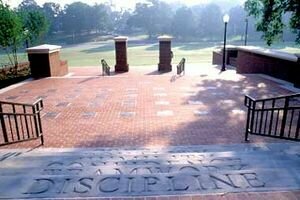 Four landscaped terraces step down toward Bowman Field as if to mark the passage of a cadet through his life at Clemson. (King, Robert, "Clemson alumni memorial to honor military heritage", The Greenville News, Greenville, South Carolina, 9 June 1995.) "The fund-raising for the plaza exceeded its $485,000 goal, and the alumni hopes to use the money left over to provide for an endowment for maintenance of the plaza," said Gerald Vander Mey of the Campus Master Planning Office. (Roberts, Kevin, staff writer, "Veterans' memorial takes shape - Plaza dedication set for June 8", The Tiger, 2 April 1996.) Former Clemson professor Col. Ben N. Skardon, U.S. Army, Retired, who survived the Bataan Death March, and Lt. Gen. Paul Blackwell, retiring deputy chief of staff for operations and plans for the U.S. Army, were the featured speakers. Both men are Clemson graduates. (Hanger, Nancy, "Time to remember our history - Clemson dedicates new plaza honoring its military heritage", Independent-Mail, Anderson, South Carolina, 9 June 1996.) Some 400 gathered to observe the ceremony upon which light rain fell. The Brick Association of the Carolinas awarded the 2002 Design with Brick's President's Award to Seamon Whiteside & Associates Inc. of Mount Pleasant and Clemson's Campus Planning Services for their collaboration on the Military Heritage Plaza. This is the Clemson Wiki project's 1,133rd article, and the first contribution by a sysop on the Clemson Wiki's sister project KUpedia at the University of Kansas. Military Heritage Plaza features a picturesque outdoor space, with a patio or veranda-like feel. Located adjacent to Tillman Auditorium this outdoor space can fit stand alone events as well as those in coordination with indoor events. Overlooking Bowman Field and downtown Clemson, the Plaza is another great location to hold your next event. Some popular events held at the Plaza include graduation parties, cookouts and speakers. The Plaza also features historic decorative accents including war medals, a statue of a soldier and other memorable items making it the perfect location with a great ambience and history. Military Heritage Plaza is managed by Clemson Major Events. This page was last modified on 10 October 2009, at 08:15.